Last December, Metro launched its official Facebook page in an attempt to better communicate with customers and taxpayers using the ubiquitous social networking tool. By the end of 2009 Metro had a few hundred fans on Facebook. This past weekend Metro’s Facebook page topped 2,000 fans and the number keeps growing. Metro’s 2,000+ fans can easily stay up to date with what’s going on with the agency without leaving the comfort of their favorite social network. Updates from Metro – including stories from The Source and service updates – are listed on fans news feeds and can be “Liked”, commented on or shared just like anything else on Facebook. This is actually a great way to let us know what you think of our stories here on The Source – I check the page every day to see what stories are getting a lot of “Likes” and which ones are sparking discussion on Facebook. Of course, well over a million people board Metro buses and trains every day and L.A. County has a population that exceeds nine million people – so 2,000 fans is just a drop in the bucket. So if you’re not already a fan, become one. And if you are, make sure to tell your friends to become fans. It’s really the best way to stay in touch with – and keep a watchful eye on – this massive tax-payer funded agency that is working to keep L.A. moving. 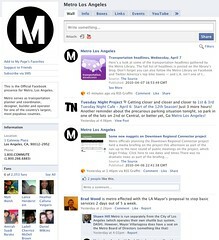 Check out some of Metro’s other Facebook pages, after the jump.